The price of bitcoin is currently at its highest level since 10th of April, when the value experienced a massive surge amidst the financial crisis in Cyprus. In fact, there have only been two days in the history of the digital currency that the price of bitcoin has been higher than the $171 it is now, at the time of writing. But what is causing the current spike? Well, it seems there are a few possibilities. The closure of black marketplace Silk Road by the FBI on 2nd October was seen as a real make-or-break moment for bitcoin – if it could weather this storm, it would prove itself as a durable and trustable currency. And weather the storm it did. The price of bitcoin fell from $125.49 on 1st October to $99.81 on the 2nd, but the very next day, the price was back up to $116.82 and it hasn’t really stopped rising since. 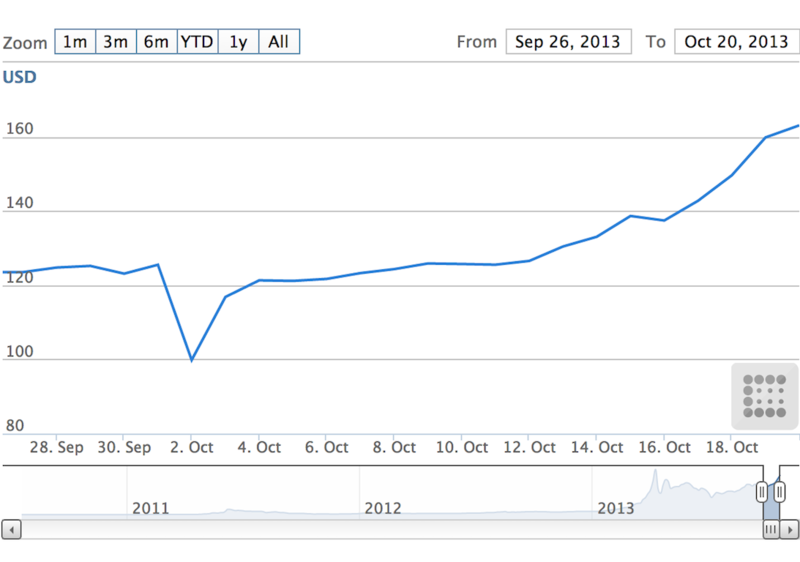 The price of bitcoin took a tumble after Silk Road closed, but it has risen pretty much every day since. 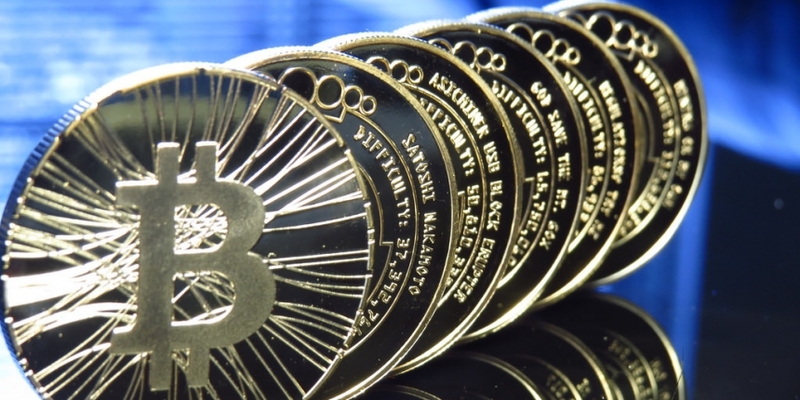 There are a number of arguments as to why the closure of Silk Road could have helped to increase the price of bitcoin. Could it be that bitcoin is in greater demand simply because more people know about it due to global mainstream media coverage of the Silk Road fiasco? Perhaps. But many people, I’m sure, would also have been put off going anywhere near bitcoin after learning about its integral part in a website selling drugs, weapons and all sorts of other dodgy criminal necessities. Maybe people are flocking to buy bitcoin now because they think its dark side is dead and buried, leaving legitimate and respectable businesses in the space to flourish. But … this isn’t really the case, as there are already a number of alternative dubious sites jostling to fill the void left by Silk Road. Nevertheless, Jon Matonis, executive director of the Bitcoin Foundation, believes the recent price increase is, in part, due to the closure of Silk Road and bitcoin’s resilience to this. “[There was great] relief in the market that Silk Road was not the only price support, which has taken the market to new five-month highs,” he explained. The thing is, Silk Road is pretty much yesterday’s news now, yet the price of bitcoin is continuing to rise, which suggests there are other factors in play. Bitcoin’s period of growth coincided with the US government’s shutdown. Coincidence? Or was it a sign that people were terrified the value of the dollar was going to nosedive so started to bulk-buy bitcoins? As touched upon earlier, a lot of people put the huge increase in the price of bitcoin back in April down to the economic crisis in Cyprus. This saw many people lose faith in their central currencies and turn to bitcoin. Bitcoin, of course, isn’t inflationary. It’s limited – there will only ever be 21 million – and it’s decentralized, so no government is able to suddenly decide to create more bitcoins. For these reasons, it’s easy to see why many people consider it a safer bet than the dollar. It’s not just developments in the US that have been making their mark on bitcoin recently: goings-on in China have also been causing a stir. “I think the price increase has definitely to do with the increase in trading volumes in China,” said Bobby Lee, CEO of BTC China. He went on to say his company has witnessed record trading volumes over the past two weeks as people living in China really start to embrace digital currency. “More and more people in China are buying (and trading) bitcoins, so it is natural that prices would go up as a result,” Lee added. Matonis agrees that China has had a large part to play in bitcoin’s recent price rise. He believes that the country will continue to be “net buyers” of bitcoin for a number of political reasons, including capital controls and the lack of true currency convertibility. “Also, the explosion of new bitcoin exchanges in China will make bitcoin more accessible to retail users who are already comfortable with virtual currencies via their use in Chinese culture already,” he added. Alistair Cotton, corporate dealer at Currencies Direct, said Chinese internet giant Baidu’s recent decision to accept bitcoin for one of its services has given the perceived legitimacy of bitcoin a real boost. “The value I see in bitcoin long-term is as an alternative payments system, not as a speculative tool, so as bitcoin becomes more widely accepted, its value as a medium of exchange should begin to overwhelm the speculative value people are currently placing on it,” he said. With so many major events taking place within a week or so of each other, it’s difficult to tell which had the biggest impact on the price of bitcoin. The question we need to ask now is this: will it last? Cotton believes the price will continue to fluctuate due to the current “absence of proper market structure”, however he predicts it will start to level out as intermediaries like market makers come to the floor and are forced to quote two-way prices. Mark Murphy, executive vice president of communications at SecondMarket, which facilitates investment in Bitcoin Investment Trust, said he’s not sure whether the price will continue to fluctuate, but is convinced that the adoption rate of bitcoin will continue to increase. “This could result in higher demand and a higher price,” he concluded. What do you think is behind the price rise and do you think it will continue?